1. They ARE different… PERIOD… so don’t lump them all together and expect them to react the same way, enjoy the same things, and have the same talents or needs. Avoid comparisons that pit them against each other… Let them be their own unique person within the family, in their own race against themselves not against their brother or sister. 3. Focus on retelling their sibling story in a positive light and do this by catching them making connections and good choices together… Are there any moments in their day when they actually get along? If so, notice these moments more than you notice the arguing, the shoving and the complaining. 4. The smallest bits of honest attention might change their day… everyone wants you to connect with them so give them 3-5 minutes of time to be your special kid… allow them to show and tell and lead the conversation without judgement or critque just connect for a small moment of each day with each kid. One of my favorite children’s books for helping children understand the reading comprehension concept of cause and effect is a book called That’s Good, That’s Bad by Margery Cuyler. 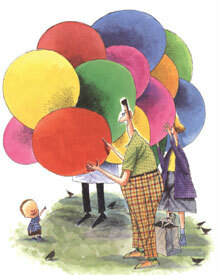 In this book, a young boy, starts his visit to the zoo when his parents get him a shiny red balloon. He is suddenly lifted high above the zoo. He loved flying high above the zoo so he could see all the animals below him. The story goes back and forth between bad and good outcomes until the boy ends up plopping back into his parents arms when a stork carries him across the zoo. This book helps to open up a discussion with children about how each event in story has an impact on the whole storyline. When they understand this they begin to realize they can control the storyline in their own writing by shifting positive and negative events and outcomes. What does this have to do with parenting????? Wouldn’t it be great if we could help our children connect to the cause and effect of their behaviors and in turn, help them see that their actions affect the storyline of their day. Helping our children experience the real life logical consequences to their behavior can help them see that they have power in their choices and when they make positive choices they can have the “good life”. Here is the honest truth… It is the first week of July, halfway through summer and it is clear to me that brothers and sisters don’t always get along. We have a choice to make as their parents… and what we decide could make or break the rest of our summer. Here are three responses that parents make when dealing with the brothers and sisters living in their home. We can insist on positive relations between our children at all times. Saying things like: “You are brothers and you will be best friends for a lifetime no matter what” or “You are lucky to have a sister so hug and make up.” Or when we hear things like, “I don’t like you!” or “You make me soooo mad!” we could quickly cut the conversation off and make them feel ashamed for being negative with their words and emotions. When we choose this approach it may seem like we are helping our kids solidify positive relations with each other. For the short term it might silence the negative emotions, but what we might be doing in the long term is creating more resentment because the honest negative emotions are not allowed to surface. We could settle into a doom and gloom perspective when our children start to fight; assuming the worst. And we could begin to think that our kids will never get along. We might say things like, “ My oldest and youngest just can’t get along, I know their personalities just don’t mesh and never will” Or “All my kids do is bicker. They will never get along so why bother making them be friendly with each other now.” When we choose this perspective we emphasize their differences, encourage the negative relationship and avoid honest conversation about how to get beyond the differences. It can become a situation where we portray them as enemies and they repeat the behavior over and over again assuming it is their role in the family. Here is a third solution for dealing with sibling emotion. What if we acknowledge the mixed emotions and have our children tell us the truth of how they feel? Even if the truth hurts (I can’t stand to be around my baby sister, I don’t want him to be my brother anymore, I hate her, I wish he would go away) we can at least allow them to get the emotions off their chest. We can begin by saying things to them that reinforce the truth of what they are feeling, “ I understand that sometimes you wish you had mom and dad all to yourself” or “I get what you are saying, you are annoyed by your little sister today.” Once they share the emotion they may begin to problem solve on their own about how to get along. If they can’t tell you how they really feel out loud then have them express it in another way. They can do this through: writing, drawing, using puppets, storytelling, or acting it out. Then start to focus on the positives even the smallest moments when your children are getting along. Allow them to recognize these moments. Then help them to realize that even though the truth is that they don’t always get along they do have moments when they can connect. These positive moments may begin to happen more often as the children find things they have in common and when we acknowledge the mixed emotions of being siblings. I will be speaking at the Honeybee bookstore on the topic of emotions. This blog ties nicely to our discussion last month on Sibling Rivalry and is a great intro into our discussion on how to help children deal with their emotions. If you like this conversation and want to continue it, join me July 11th from 10-11 AM at the Honeybee bookstore in Madeira. Please feel free to share this info with a friend who might want to hear some fresh perspectives and if you are planning to come to the Honeybee bring a friend along. Children are always welcome, too.